Osama bin Muhammad bin Awad bin Laden is born in Riyadh. He is 17th of 52 children sired by Muhammad Bin Laden--Saudi Arabia's wealthiest construction magnate. Bin Laden graduates from King Abdul Aziz University in Jiddah with a degree in civil engineering. Soviet invasion of Afghanistan. Bin Laden leaves Saudi Arabia to join the Afghan resistance (mujahedeen). From the Pakistani border, bin Laden raises funds and provides the mujahedeen with logistical and humanitarian aid. According to Islamic sources, bin Laden participates in numerous battles during the Afghan war against the Soviets as a guerilla commander, including the fierce battle of Jalalabad which led the Soviets to finally withdraw from Afghanistan. Bin Laden establishes "al Qaeda," an organization of ex-mujahedeen and other supporters. Its mission is to channel fighters and funds to the Afghan resistance. The National Islamic Front (NIF) stages a military coup and takes control of the Sudan. After the Soviets pull out of Afghanistan, bin Laden returns to Saudi Arabia a hero. He becomes involved in opposition movements to the Saudi monarchy while working for his family construction firm, the Bin Laden Group. Bin Laden flees Saudi Arabia, after being confined to Jiddah for his opposition to the Saudi alliance with the United States. He moves first to Afghanistan and then to Khartoum, Sudan by 1992 (Source: Newsweek 2/1/99). Sudan had begun to allow any Muslim into the country without a visa, in a display of Islamic solidarity. Allegedly, hundreds of suspected terrorists and ex-mujahedeen come to Sudan as a safe haven (Source: New York Times 9/21/98). US troops fight Persian Gulf War. After victory, the US establishes a large permanent military presence in the region, including Saudi Arabia. Saudi Arabia is the land of "the two most holy places" in Islam--Mecca and Medina. 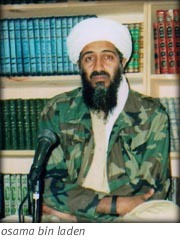 According to the current indictment against bin Laden, from 1992 on, bin Laden and other Al Qaeda members stated privately within the organization that a) Al Qaeda should put aside its differences with Shiite Muslim terrorist organizations, including Iran and its affiliated terrorist group Hezbollah, to cooperate against the perceived common enemy, the United States and its allies; b) the US forces stationed on the Saudi peninsula, including both Saudi Arabia and Yemen, should be attacked; and c) the US forces stationed in the Horn of Africa, including Somalia, should be attacked. Bin Laden begins to set up legitimate businesses in the Sudan, including a tannery, two large farms, and a major road construction company. When Saudi Arabia began pressuring Pakistan to get rid of the mujahedeen near the border with Afghanistan, bin Laden reportedly paid for 480 Afghan vets to come work with him. The Sudanese leaders liked this wealthy Saudi who was enthusiastic about investing in their fledgling Islamic state. A bomb explodes in a hotel in Aden, Yemen, where US troops had been staying while en route to a humanitarian mission in Somalia. The bomb killed two Austrian tourists; the U.S. soldiers had already left. Two Yemeni Muslim militants, trained in Afghanistan and injured in the blast, are later arrested. US intelligence agencies allege that this was the first terrorist attack involving bin Laden and his associates (Source: New York Times 8/21/98). Sudan is placed on State Department's list of countries that sponsor terrorist activities (Source: Washington Post 8/23/98). According to US government charges, bin Laden's followers try to obtain components of nuclear weapons and begin to work with Sudan's NIF to develop chemical arms (Source: US News and World Report 10/5/98). Eighteen US troops are killed in an urban attack in Mogadishu, Somalia. American law enforcement, intelligence and national security officials are divided as to whether, as a federal indictment charges, bin Laden and his adherents helped train and arm the men who killed the US troops (Source: New York Times 2/8/99). Ramzi Yousef, mastermind of the World Trade Center bombing, is captured in Pakistan and extradited to the United States. A search of his former residences leads investigators to believe he is financially linked to bin Laden. Also, he had stayed at a bin Laden financed guest house while in Pakistan. Unsuccessful assassination attempt on the life of the President of Egypt, Hosni Mubarak, in Addis Ababa. U.S. intelligence sources believe bin Laden was somehow linked. Bin Laden wrote an open letter to King Fahd of Saudi Arabia calling for a campaign of guerrilla attacks in order to drive U.S forces out of the kingdom. Five Americans and two Indians are killed in the truck bombing of a US-operated Saudi National Guard training center in Riyadh. Bin Laden denies involvement but praises the attack (Source: Washington Post 8/23/98). The four Saudi men accused of bombing the Saudi National Guard training center in Riyadh are beheaded in Riyadh's main square. Before their execution, they are coerced by the Saudi's into a public confession. In the confession, they claim to have read bin Laden communiqués. President Clinton signed a top secret order that authorized the CIA to use any and all means to destroy bin Laden's network. A large truck bomb devastates the US military residence in Dhahran called Khobar Towers, killing 19 servicemen. The US military initially linked bin Laden to the attack but now believe a Saudi Shiite group was responsible (Source: Washington Post 8/23/98). U.S. investigators still believe bin Laden was somehow involved. A secret grand jury investigation begins against Osama bin Laden in New York. Bin Laden signed and issued a Declaration of Jihad outlining his organization's goals: drive US forces from the Arabian Peninsula, overthrow the Government of Saudi Arabia, liberate Muslim holy sites, and support Islamic revolutionary groups around the world. He declares that Saudis have the right to strike at US troops in the Persian Gulf. Gwynne Roberts conducts interview of bin Laden for the British documentary program Dispatches. Bin Laden threatens to wage an Islamic holy war against the United States and its allies if Washington does not remove its troops from the Gulf region (Source: Reuters 2/20/97). CNN airs an interview with bin Laden in which he criticizes US "occupation of the land of the holy places." Bin Laden issues joint declaration with the Islamic Group, Al Jihad, the Jihad Movement in Bangladesh and the "Jamaat ul Ulema e Pakistan" under the banner of the "World Islamic Front," which stated that Muslims should kill Americans including civilians--anywhere in the world. ABC's John Miller interviews bin Laden in Afghanistan. The grand jury investigation of bin Laden, initiated in 1996, issues a sealed indictment, charging Bin Laden with "conspiracy to attack defense utilities of the United States." Prosecutors charge that bin Laden heads a terrorist organization called al Qaeda, the base, and was a major financier of Islamic terrorists around the world. ABC Nightline John Miller interview with bin Laden broadcast. Two simultaneous explosions at US embassies in Kenya and Tanzania. The bomb in Nairobi, Kenya kills 213 people, including 12 US nationals, and injure more than 4,500 . The bomb in Dar es Salaam kills 11 and injures 85. No Americans died in the Tanzania bombing. US retaliation against bin Laden--cruise missiles attack a suspected terrorist training camps in Afghanistan and Al Shifa, a pharmaceutical plant in Khartoum. US intelligence claims that Al Shifa is tied to the production of chemical weapons for bin Laden. The Sudanese government vehemently denied these claims. The Sunday Times of London reports that bin Laden is sending Islamic mercenaries to Kashmir to support an Islamic secession campaign. A new superceding indictment is issued against bin Laden, Muhammad Atef and a host of other suspects. They are charged with bombing of two US embassies and conspiring to commit other acts of terrorism against Americans abroad. Two rewards of $5 million each are offered for Atef and bin Laden. Atef is described as bin Laden's chief military commander. Bin Laden summons Rahimullah Yusufzai, a reporter for Pakistan's The News, Time Magazine and John Miller of ABC News, to his tented encampment in Afghanistan's Helmand province for interviews. TIME correspondent conducts interview with Osama bin Laden. ABC's second interview with Osama bin Laden is broadcast on ABC News. TIME and Newsweek publish interviews with Osama bin Laden that were conducted in late December. The US Attorney's office files its most complete indictment to date of Osama bin Laden and 11 other suspected members of his terrorist organization. The grand jury charges the men for conspiring to kill American nationals. The first count of the indictment charges that several of the co-defendants, acted with other members of "al Qaeda," a worldwide terrorist organization led by bin Laden, in a conspiracy to murder American citizens. The objectives of the terrorist group allegedly include: killing members of the American military stationed in Saudi Arabia and Somalia; killing United States embassy employees in Nairobi, Kenya, and Dar es Salaam, Tanzania; and concealing the activities of the co-conspirators by, among other things, establishing front companies, providing false identity and travel documents, engaging in coded correspondence, and providing false information to the authorities in various countries. Four followers of Osama bin Laden are found guilty of charges stemming from the 1998 US embassy bombings in Kenya and Tanzania. Mohamed Rashed Daoud Al-Owhali, Khalfan Khamis Mohamed, Mohammed Saddiq Odeh, and Wadih El Hage are convicted of charges including murder, conspiracy and perjury after a nine-week federal trial during which prosecutors called over 90 witnesses, including al Qaeda informants and survivors of the bombings. Owhali and Mohamed face the death penalty at their sentencing, while Odeh and El Hage face life in prison. 1. What is high-technology entrepreneurship? What is the difference between an idea and a business opportunity? High-tech entrepreneurship is a style of business leadership based on theprocess of identifying high-potential, technology-intensive business opportunities, gathering resources such as talent and cash, and managing rapid growth using principled, real-time decisionmaking skills. An attractive business opportunity consists of a great value proposition, technically feasible products, strong intellectual property, a sustainable competitive advantage, a large potential market, and a proven business model. It can be based on either a revolutionary breakthrough in technology or an evolutionary advancement; and it can target an existing market or create an entirely new one. This entrepreneurial process is relevant for both independent startups and within established corporations. Disruptive technologies are particularly interesting as discussed in Christensen's Innovator's Dilemma. See Technology Ventures by Dorf and Byers as a textbook. 2. Why do ventures require dynamic leaders who understand vision, strategy, risk, and tactics? Entrepreneurship is a process that involves identifying and reducing four major types of risks over time: people, technology, market, and financial. This is accomplished by the right combination of vision, strategy and execution. Although a compelling vision (e.g., core values and mission) and a set of strategies (e.g., product and market) are important, it is often execution that differentiates great companies from good ones. An A+ team and adaptable leadership can guide a venture through its challenging journey of growth and adversity where everyone works diligently on clear goals. Built to Last by Collins and Porras is an excellent reference as is Competing on the Edge: Strategy as Structured Chaos by Eisenhardt. 3. How does context (e.g., economic and political climate) play a role in high-tech entrepreneurship? All kinds of external forces impact entrepreneurship and reinforce the need to understand the entrepreneurial process. For instance, economic cycles can fluctuate dramatically, fostering periods of extreme optimism as well as those of deep concern and fear. And in some industries, political and government influences are the primary market drivers (e.g., biotechnology). A venture's location also plays a role, as attitudes toward entrepreneurship are different everywhere. Places like Silicon Valley, for example, offer infrastructure, networks, and talent in an environment that accepts failure in the pursuit of innovation. Friedman's The World is Flat and The Silicon Valley Edge by Stanford University Press are good references. 4. What is market positioning? Why are partnership strategies important? Positioning forces a high-tech entrepreneur to clearly identify what the product or service is, who the customers are, what benefit it delivers, and how it differs from the competition. Successful positioning requires understanding the technology adoption life cycle made famous in Crossing the Chasm by Moore and the development and nurturing of true value-added partnerships. Great entrepreneurs use every asset (e.g., vision and intellectual property) to create mutually beneficial social networks. 5. What is the purpose of the business plan? A business plan details a venture's compelling value for a growing market of customers and outlines its mission and purpose. It also introduces the venture's team, its technological solution, and its economic or business model. It is necessary for both external use (e.g., raising venture capital, gaining customers, and creating partnerships) and internal use (e.g., tracking against objectives and milestones). It provides a compass for negotiating the unforeseeable challenges ahead, rather than a definitive roadmap to success. A key reference is Sahlman's How to Write a Great Business Plan article in Harvard Business Review. 6. Why is cash flow so vital? High-tech entrepreneurship is a journey of incremental and rapid growth. Cash is a critical resource for reaching each funding milestone, which is defined by the reduction of some particular set of risks. Great startups always spend their cash wisely on the current "white hot risk". It gives stability and strategic flexibility to a venture as opportunities and problems arise. Cash facilitates the recruitment of an A+ team and the frugal ramp-up of operations. It is the one resource that cannot be allowed to go "negative," even for a short period of time. For startups, financing events are strategic and require substantial discipline, effort, and foresight. 7. What are the different sources of capital for high-tech ventures? What are the essentials of the venture finance process from both the investor's and founder's perspectives? 8. Why is high-tech entrepreneurship a team sport? How can reward systems and company culture inspire innovation? Successful innovation is a function of both creativity and teamwork. Developing an outstanding team requires setting a coherent and compelling vision, hiring and retaining people better than oneself, using proper recognition and compensation strategies (e.g., cash, stock options, and other rewards), enabling proper autonomy and delegation, and creating a culture where success is recognized and failure is allowed. Sound leadership is essential including experienced advisors and board members. A key reference is Weird Ideas that Work by Sutton. 9. Why are appropriate sales and business development skills so valuable? The ability to gain the support of many different types of stakeholders (e.g., revenue and endorsements from real customers) is important for building momentum. Basic negotiation, influence and persuasion skills are critical. Successful entrepreneurs build lasting personal relationships based upon trust. Cialdini's Influence and Goleman's Primal Leadership are excellent references. 10. What is the role of ethics in high-technology entrepreneurship? Entrepreneurship is not all about personal financial gain. It concerns crafting a lifelong plan to make a positive impact on society. Character does matter. Failure is OK; unethical behavior is not. True wealth requires the creation of enduring value, which requires integrity and ethics. Entrepreneurship and business are not just contact sports subject to their own arcane rules, but an integral part of life that reflect the values of each participant. A culture of dependability and professional trust starts with the founding team's initial behaviors. A key reference is Komisar's Monk and the Riddle. *Special thanks to Randy Komisar, Richard Dorf, and all others who contributed to this list. Drawn from Technology Ventures: From Idea to Enterprise by Dorf and Byers, McGraw-Hill, 2cd Ed. See textbook websites at http://www.mhhe.com/dorfbyers2e and http://techventures.stanford.edu. Please send comments to tbyers@stanford.edu at Stanford University. Revised Winter, 2007. Video wall plasma broken er, thing. Somone put their sock over the lens? The price of gas in San Francisco! Why do they bother with 9/10ths BTW? Lean on me. We all need. Somebody to lean on. Pop quiz! - How many clicks does it take to follow the path down Lombard Street? Armed furniture robbers starting the gig! Wot you looking at Willis? I 'tought I saw a vawentine bawoon! I did saw a vawentine bawoon!! Secret son of Casper the Friendly Ghost and Pixar's "Cars"? The ultra-elite reindeer police unit. Interesting shot because evidently, there is a large building there and it's scheduled for demolition - Google Future View(tm) ? Look Mamma, it's an Immersive Media Street Level View-Mobile patented 11-lens camera. The building from the Beastie Boys album "Paul's_Boutique" now a restaurant named after it. Money shot in broad daylight? Mirror mirror on the pole, who is the fairest Google van of all? Hey dude - high five! Love is the answer - but what is the question? Honey, look before you turn - we're already split this thing in half once. But, Darling, it's my form of lawn art-- I call this piece, "stacked tires!" I do construction to keep my buns in shape. The boy in the bubble and the baby with the babboon hair..
A local man tries to befriend one of our new Mini-Martian overlords. I couldn't read it without my glasses your honor. A happy man. And his van. Wonder if he's called Stan. Just another brick in the wall - oh, and someone making a phonecall. Quick! Get this all cleared up before that funny looking van takes our picture. Tiny isolated nugget of image capturedness - one of the team's home ground? Wargames - who wants to play global thermonuclear war? Clear shot of most of the Google van - looks like the one I saw today without the dent. If I pay your ticket, can I borrow you car? If you stare at this for long enough, you can see a half naked woman. Or a rabbit. Or Castro. You decide. Who needs legs when you have a wheel? If we ever have to hide in this shelter, we'll be just fine. Here lies Fido, Freckles and fish-face..
See how bad Bay Area traffic is..
Getting ready to torch the evidence?